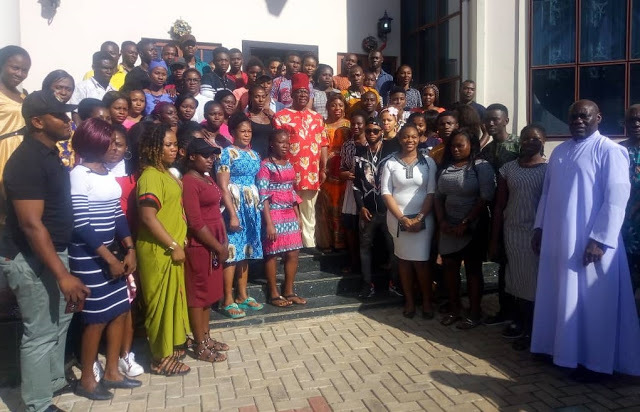 The Senator Representing Anambra Central at the National Assembly, Senator Victor Umeh has presented the sum of ten million Naira (N10M) to continue the educational funding of over one hundred and eighteen students under his scholarship scheme. The event which commenced with a holy mass, provided a unique platform for the benefiting students to rub minds with their sponsor on their academic mileage so far. Beneficiaries numbering over one hundred and eighteen were drawn from post-primary, tertiary and post-graduate educational divides. Giving a personal view of the scholarship program, a Catholic Priest and Lecturer, Department of Philosophy, Chukwuemeka Odimegwu Ojukwu University, Reverend Father Eugene Anowai, noted that Senator Umeh’s desire for human success has been the backbone of his milestone policies over the years. Reverend father Anowai pointed out that the benefactor has obtained a lifetime blessing for adding to the growth of humanity, praying for God’s guidance and blessings as he steers the course of human development. For Senator Umeh, the desire to fund the education of the students is inspired by childhood educational rigours given his modest family background. The Lawmaker noted that it was most imperative to develop the academic potential of the students, who will in turn give back to their parents and society at large. In their various remarks, the Traditional Ruler of Owelle Ancient Kingdom, Igwe Anthony Onyekwelu, and an APGA chieftain from Aguata Council Area, Honourable Godwin Ezeno, said the program was worthy of emulation, especially for those who have the capacity to impart humanity. Miss Nneka Ilochi, a beneficiary of the scholarship at an advanced stage of her PhD program, and Master Osae Cleopas, a Nigeria-born Ghanaian secondary school student also under the scheme, thanked the benefactor, Senator Umeh, and pledged to accomplish the vision of the scholarship program. The scholarship program, an annual project that has run for over a decade, aims at sustaining the academic quest of students who have demonstrated excellence in educational and social excellence. There was also presentation of gifts to Senator Umeh by the students and other groups.